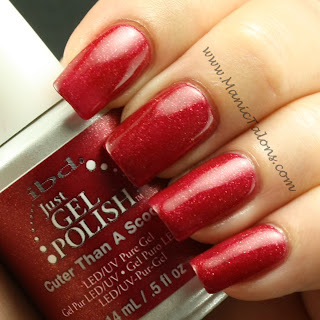 I have 6 of the 8 polishes from the IBD Just Gel Mad About Mod collection to show you today. I was pleasantly surprised by this collection! While darker for fall, there is still a nice variety of colors and finishes. Before I get into the individual swatches, just a quick reminder that there are only 3 days left to enter my Nails for a Cause Giveaway! Now for the swatches. First up, Happliy Brighter After. No, that's not a typo. At least not on my part. Happily is actually misspelled on the bottle. Funny, but it certainly doesn't impact the polish inside. This is a gorgeous, muddy orange cream. I really wish I had this one a few weeks ago for Halloween. 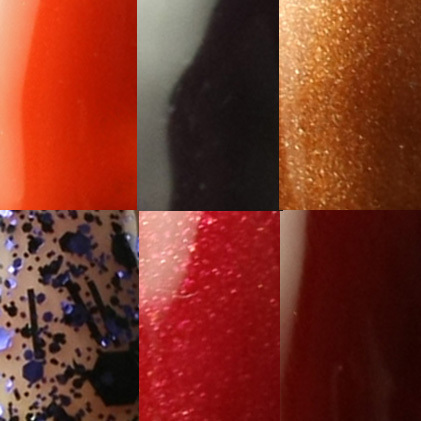 Next in the line up is a golden copper shimmer called Go-Go Above and Beyond. This one really surprised me. I was expecting more of an orange tone and really didn't think it would compliment my skin tone based on the pictures I saw of the bottle, but this is a copper I will actually wear! Perfectly Paisley is a super dark plum cream. It's so dark it almost looks black, but the purple is definitely there. I love it! I actually wore a dress in this exact color to a Christmas party a few years ago. It looks great on pale skin. Surprise bonus: this one is a perfect two coater. Of course, I swatched 3 anyway for consistency, but the third wasn't needed at all. Without the third coat, the plum tone is a little more obvious. 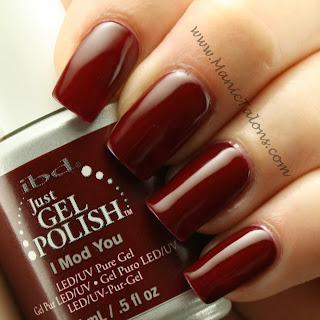 I Mod You is a deep, oxblood red cream. This one is also a 2 coater. While gorgeous, this one is probably my least favorite of the collection. Not because I don't love it, I just love it a little less than the others. Cuter than a Scooter is...well...cuter than a scooter! This one is my absolute favorite of the 6 and is the one I chose to wear for the rest of the week. It's dark pink that is loaded with shimmer. The light box picture doesn't do this one justice. It accurately captures the base, but leaves a lot to be desired when it comes to the shimmer. It's the shimmer that makes this polish and turns it from pinkish red to true pink. So I abandoned the light box and took this next shot under the ottlite. See how the shimmer makes it appear to glow from within? Perfection! Finally, I have Thistle My Whistle. This is one of three glitters from this collection, and the only one that really peaked my interest with its combination of blue and black glitter of different shapes and sizes. Unlike the glitters from the last two collections, this polish is packed with glittery goodness. I didn't have to store it upside down or dig the glitters out. A good shake was all I needed to get ample amounts of glitter in every shape and size. This is three coats over the natural nail. And here it is as one coat layered over Happliy Brighter After. You can see how loaded it is based on just one coat. Again, where was this color during Halloween!?!? Lets take a closer look. I spread a blob over a piece of white paper to show the various sizes of glitter. You can also see in this picture that the blue glitter takes on a purplish tint at some angles. I'm seeing at least 3 different sizes of blue hexes and at least 4 different sizes of black hexes in addition to black strip glitter. Finally, as I mentioned above, I chose Cuter than a Scooter as the base for the mani I'm wearing this week. Details below. That's all for today. Don't forget to enter the giveaway! I may have to get Cuter than a Scooter! (how cute is that name?) Thanks for the amazing swatches, as usual!! Can you use the IBD gel polishes together with the Gelish system (base and top coat)? Yes, you certainly can! :) I mix systems all the time with no issues. I'm currently wearing a number of brands. I have Gelish foundation over a silk wrap on one nail and Kiss base gel on the others. IBD Cuter Than A Scooter topped with Gelish Top It Off, then Kiss Top Gel over the stamping. Just a word of caution...we all do it [mix brands]. The danger is "IF" a client has a reaction [and it has happened]...it could cost you your license. Use with care. This is a valid point. I don't use gel on others, so Mixing brands is not an issue for me. 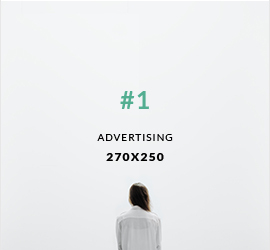 But do use care if mixing brands on others. How did you use the konad reg color with the gel polish. 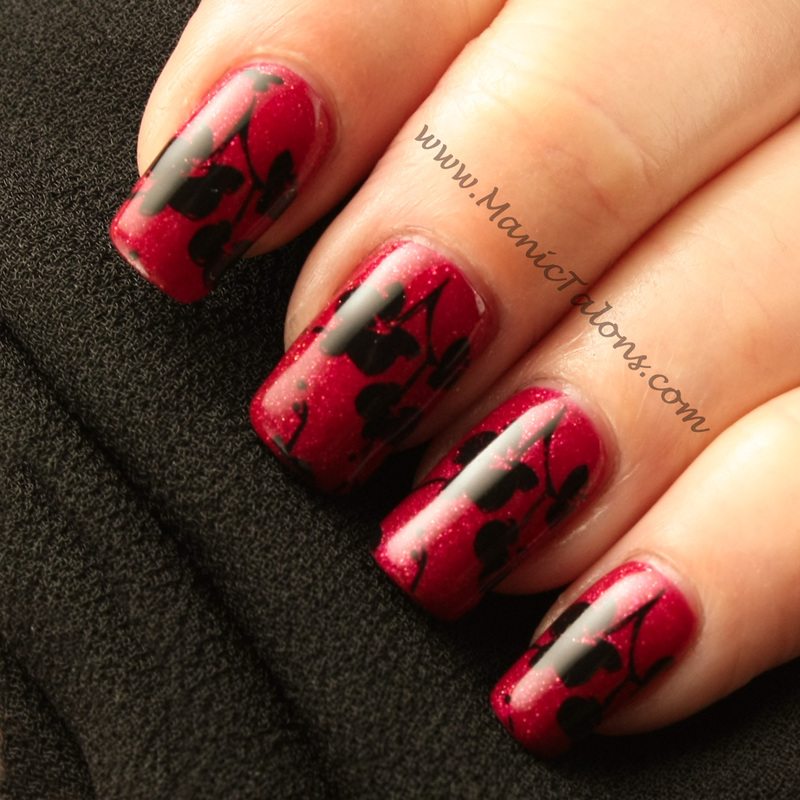 did you stamp after the color coat or on top of the top gel coat? Couture Gel Nail Polish Contest - Enter Now!